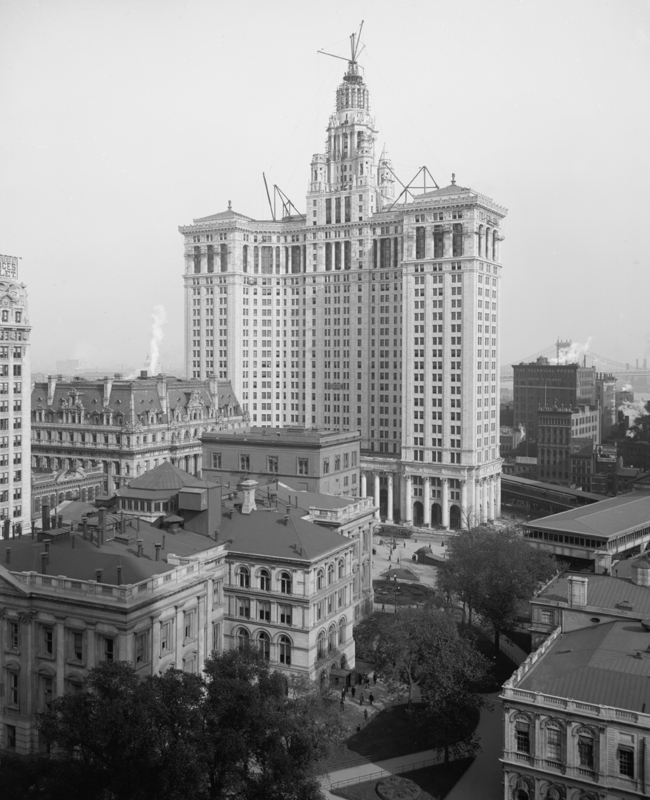 Although construction on the Municipal Building began in 1909, the inconsistency of the soil and depth of the bedrock, as well as the subway station and rail connections, slowed progress, so the building was completed in 1914, a year after the Woolworth Building. Creating 1,250,000 square feet of space to consolidate more than a dozen city agencies, the Municipal Building afforded twice the office area of the Woolworth Building. In 1907, a design competition was held for a new city office building, and the prominent firm of McKim, Mead & White, who had been urged by Mayor George B. McClellan to enter, won with a proposal for a classically detailed skyscraper-- an irony, given that Charles Follen McKim disdained high-rise buildings as destroyers of civic beauty. The building was designed by a younger partner, William M. Kendall, who adroitly placed the C-shaped plan on an irregular site, bisected by Chambers Street and criss-crossed by underground transit connections. The 25-story main block was surmounted by a "wedding-cake" classical tower of 15 stories, adorned with the gilded sculpture of Civic Fame. Rising to a height of 580 feet, including its central spire, the expansive block of the Municipal Building achieved a vertical character through its siting. A monumental triumphal arch on axis with Chambers Street seemed to carry the roadway right through the building, and the view of the arch and spire seen from the west framed the building, making it appear to be a tall tower.